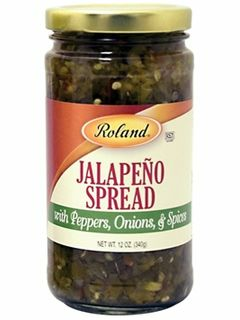 Roland Jalapeno spread adds the perfect flavor and spice to all your favorite meals. Add this spicey spread to nachos for an extra delicious kick. Pour the Roland Jalapeno Spread over chicken with salsa and shredded monteray jack cheese for a mexican inspired entree. This hot and spicy spread is sure to liven up any dish. Made with peppers, onions and spices, our Jalapeno Spread is fat free and versatile; this hot and spicy spread is sure to liven up any dish. This product is Kosher certified by KSA. Roland Jalapeno Picado para Untar - 12 oz. Absolutely LOVE this stuff! I put it on everything..
ConsPaying this price. I found it 3 weeks later in a shop for $4, I bought all 8 bottles on the shelf.